The difference between successful and unsuccessful people is one thing: the slight edge. According to Jeff Olson, developing the slight edge is simply a matter of keeping it simple and practising easy, mundane habits that will bring you closer to achieving your goals. 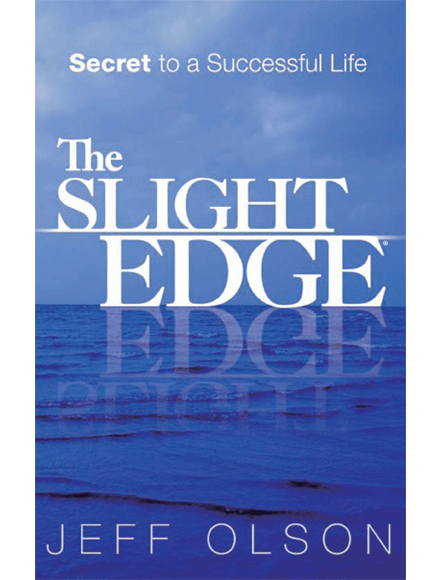 We have compiled all the advice from The Slight Edge: Secret to a Successful Life into a series of actions you can try for yourself. If you’re wanting to reach a certain goal, or are just looking to improve yourself, this is the book for you! Jeff Olson is the founder and CEO of Nerium International. He is a leader in the direct sales industry, earning an industry-wide reputation as a top distributor, earner and more since first joining the industry in 1988. He is also the owner of Live Happy and the author of The Slight Edge. To help others reach greater levels of financial freedom and personal excellence, Olson shares the philosophy and principles he used to gain success as an entrepreneur and CEO. Shift into a mindset of success. Adopt and practice slight edge habits. Evaluate your life as it currently is. Develop positive, productive habits of attitude and behavior. Set, pursue and achieve your goals.